Responsibility for addressing some of the world’s hardest challenges is being pushed down to cities and metropolitan areas, often without compensating resources or structural authority. As a result, problem solving is increasingly bottom up rather than top down and delivered by networks of institutions and leaders rather than the public sector alone. The Tax Cuts and Jobs Act of 2017 provides a new incentive—centered around the deferral of capital gains taxes—to spur private investments in low-income areas designated as Opportunity Zones. Given the significant interest among investors, it is possible that this new tax incentive could attract tens of billions of dollars in private capital, making this one of the largest economic development initiatives in U.S. history. The Tax Cuts and Jobs Act of 2017 established an Opportunity Zones tax incentive, which provides a federal capital gains tax deferral and partial exemption for investments in designated Opportunity Zones. Governors in each state will select Opportunity Zones from an eligible group of low-income census tracts. Selections must be made by the third week of March 2018 (or third week of April 2018 if an extension is requested). Given the significant interest among many private investors, it is possible that Opportunity Funds will attract tens of billions of dollars in private capital, making this one of the largest economic development programs in U.S. history. This policy brief puts forward four principles to guide the selection and development of Opportunity Zones. The principles are designed to enable the greatest job creation potential and the most significant advantages for lower income resident employment, both, inside and outside the eligible zones. Throughout the document we stress the use of data analytics, local knowledge, and the need to see these incentives as just one part of a broader economic development strategy. 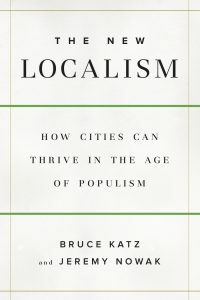 Bruce Katz explains why cities have avoided populism and partisan bickering to become hubs of policy innovation.